Are Fox Squirrels Displacing Gray Squirrels? Question: I used to have nothing but gray squirrels here in Placerville (about 2,000 ft. elevation), but over the past two to three years my gray squirrels began disappearing and now I have the eastern fox squirrels living in the same trees. It looks like they ran the gray squirrels out. Are the fox squirrels more aggressive than the gray squirrels and are they expanding their habitat? Sure looks like it. 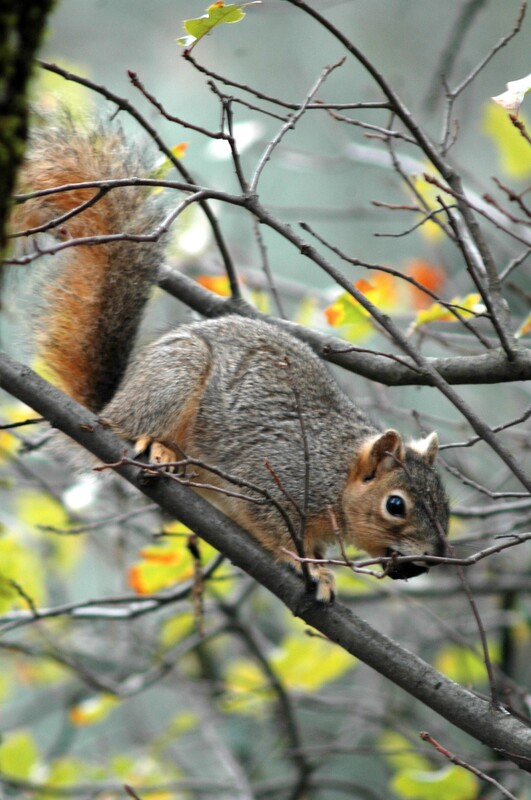 Answer: The western gray squirrel is native to California but the fox squirrel is an introduced species. According to DFG Environmental Scientist Jessie Garcia, the fox squirrel’s natural range extends throughout much of the eastern United States, the southern prairie provinces of Canada, the Dakotas, Colorado and Texas. They have been introduced to both northern and Southern California and there are reports of eastern fox squirrels displacing western gray squirrels in Southern California foothill habitats. Gray squirrel population numbers fluctuate depending upon availability of food, incidence of disease, weather and other habitat conditions. Contributing factors such as heavy snowfall covering stores of buried food, increases in predation pressure, loss of snags, duff, slash or oak trees, and scabies (mange) outbreaks may all be causes contributing to reductions in the local population and may be allowing fox squirrels to occupy this niche. Tree squirrels (genus Sciurus and Tamiasciurus) are defined as game mammals in the Fish and Game Code (Section 3950) and as resident small game in CCR Title 14 (Section 257). This means that both eastern fox squirrels (Sciurus niger) and western gray squirrels (Sciurus griseus) can be hunted and are included together in aggregate to make up one squirrel daily bag and possession limit. The bag limit is four squirrels per day and four in possession. Before hunting them, check the regulations for season dates, authorized methods of take, and which areas are open and authorize their hunting (CCR Title 14 Sections 307 and 311). Toms and hens can be easily determined by their significant head and wing color differences. If by chance you run across a rare bearded hen, even though the provisions of the law may allow you to take it, we strongly discourage it. Spring is the turkeys’ primary mating and nesting period so hens may not be harvested in order to protect their production. Answer: Blue catfish can reproduce in lakes provided they have the right cave type of habitats, according to DFG Senior Environmental Scientist Mike Giusti. Spawning blue cats construct nests under overhanging rock ledges along deeply undercut banks and other sheltered places. In lakes that are self-contained where the lake managers purchase the fish from private hatcheries, DFG cannot be sure if those fish were genetically altered for increased growth. If they were, those fish could be infertile. Answer: A second-rod stamp is only required when fishing in inland waters and may only be used in those areas that do not have special requirements where only artificial lures or barbless hooks may be used. You are allowed to fish with as many rods as you can manage while surf fishing. You may also use multiple rods for other ocean fisheries as long as those fisheries do not have hook or line restrictions (e.g. rockfish, lingcod and salmon have gear restrictions.) See Fish and Game Code Section 28.65 for more details. This entry was posted in Info, Licensing/Permits/Stamps/Report Cards, Limits, Lines/Rods/Equipment, Turkey, Wildlife Management and tagged fishing, freshwater fishing, nongame mammals, nuisance wildlife, regulations, turkey hunting, Turkeys. Bookmark the permalink.